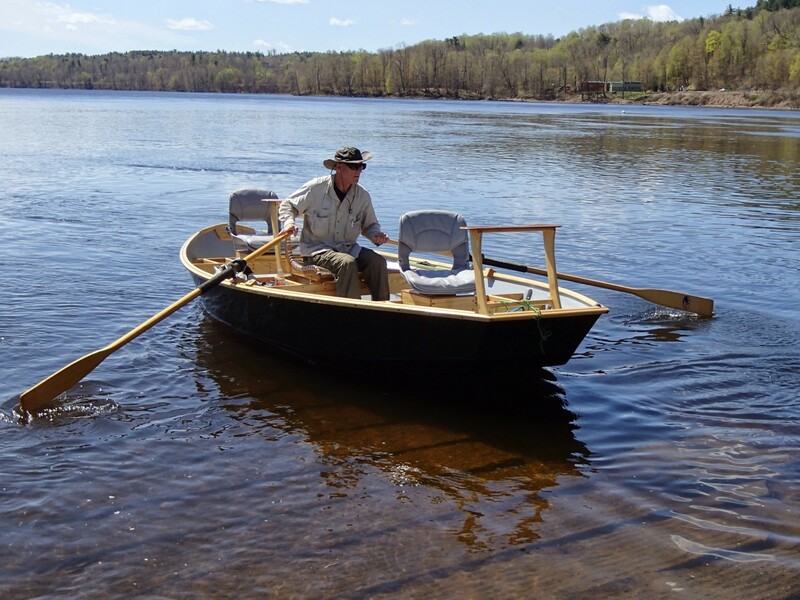 For many years I used a modified Old Town row boat for guiding. 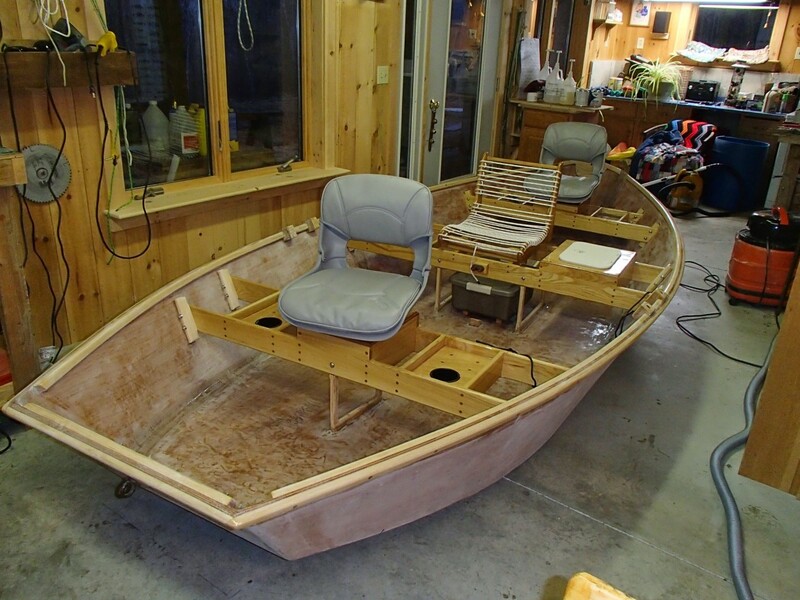 It was functional but I wanted a more comfortable and maneuverable boat. 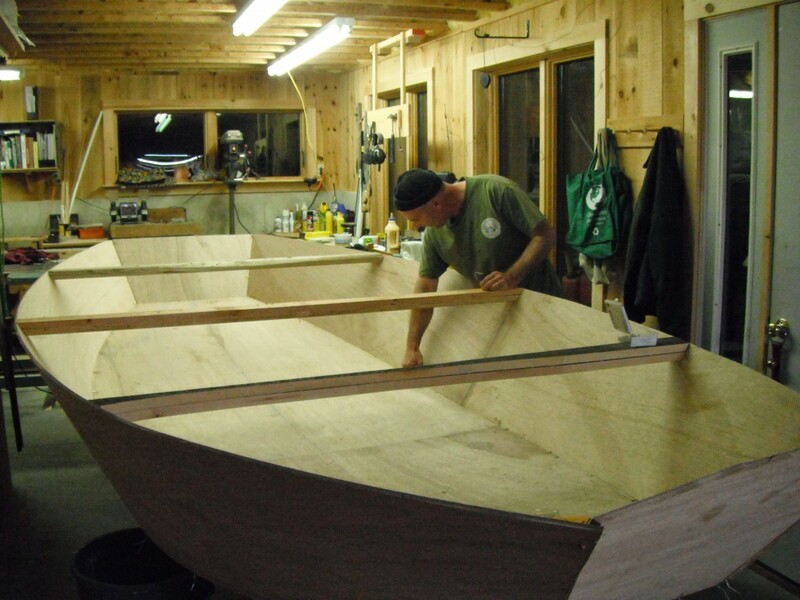 A couple of years ago while evaluating traditional McKenzie style drift boats, I found many were too large, too heavy and difficult to handle in the wind. 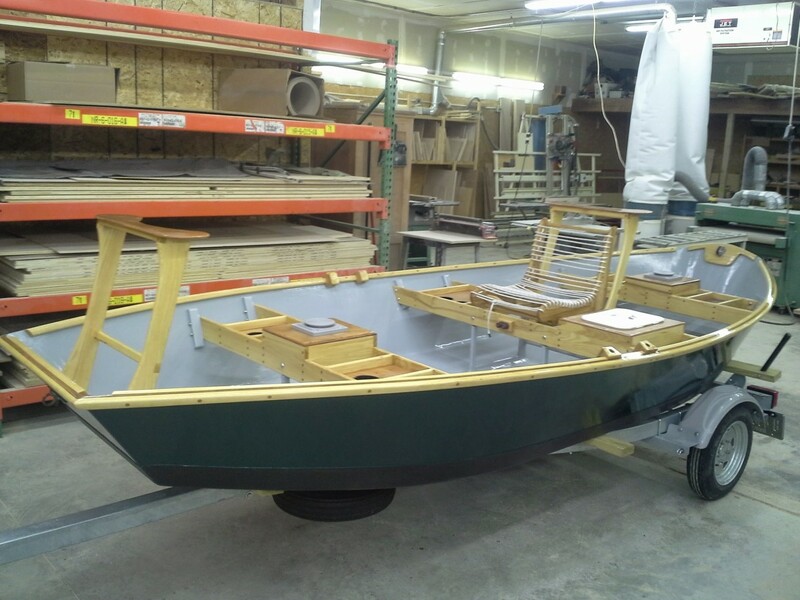 To my delight, I stumbled on a skiff style drift boat and found plans from a Montana boat builder. 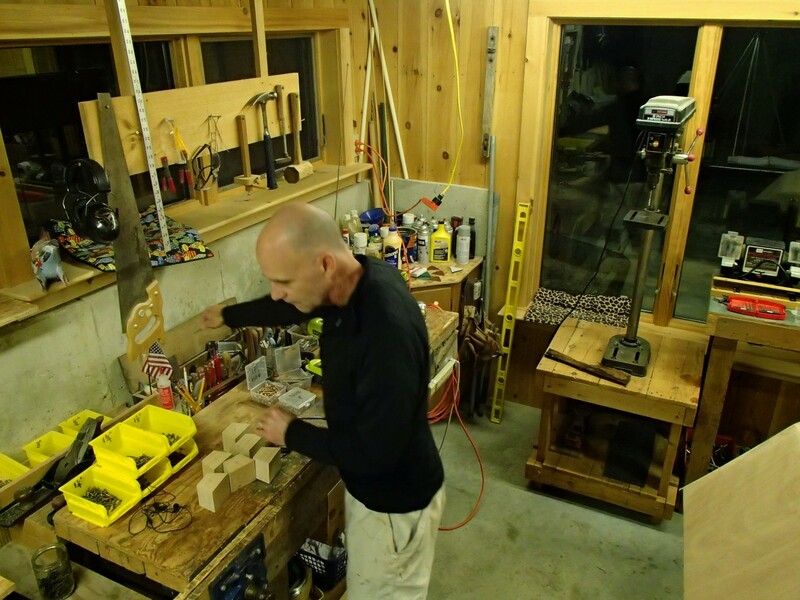 During the winter of 2012-2013 I built one in my basement. It was an absolute pleasure to row, incredibly stable and provided lots of room for clients. 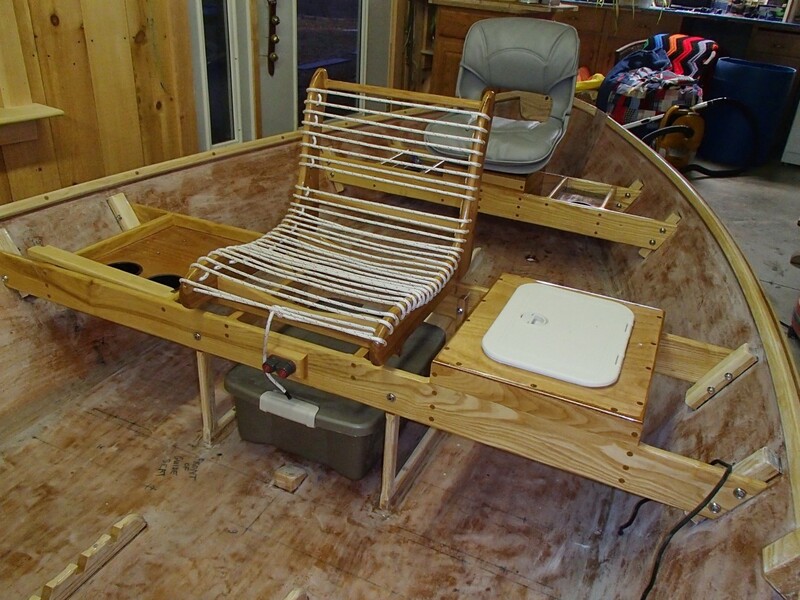 The following winter I completed my second “Freestone Skiff.” I used the same hull design, but incorporated several new components, including improved casting braces, more storage space and an adjustable foot brace. 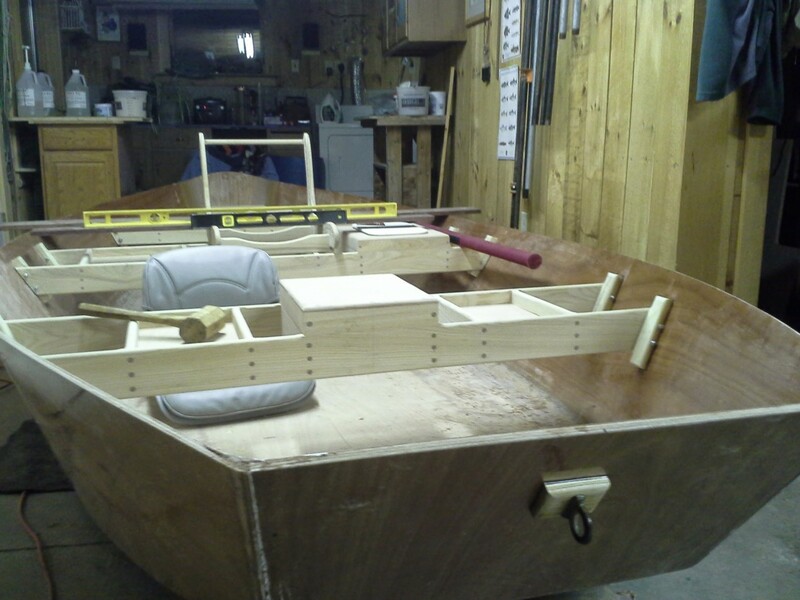 It’s an easy boat to row and incredibly maneuverable. 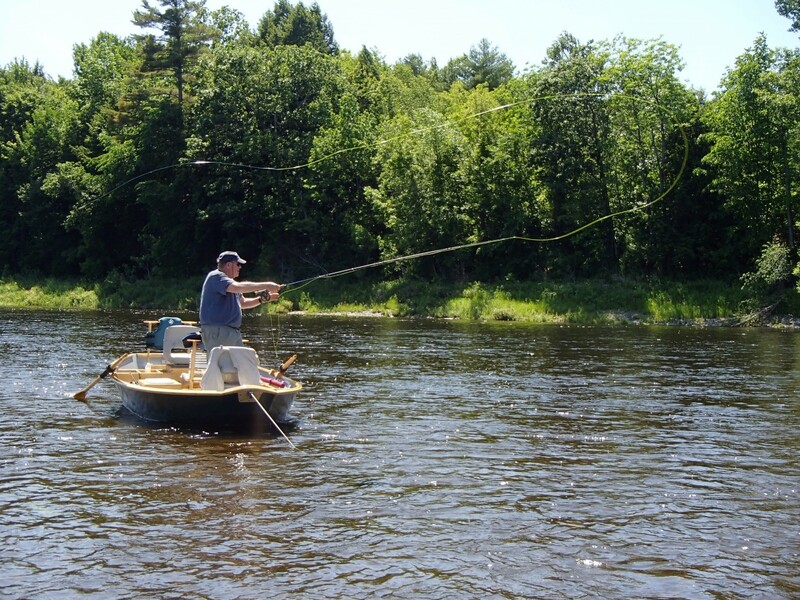 All my clients seem to enjoy their time in the boat as much as I do. But first I started with a plan. 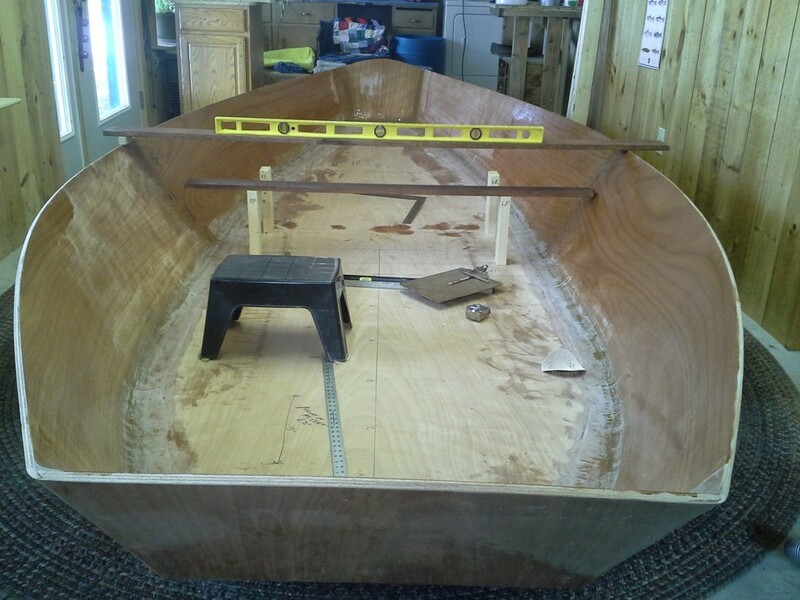 Using the plan purchased from a Montana boat builder, I began by building a scale model. 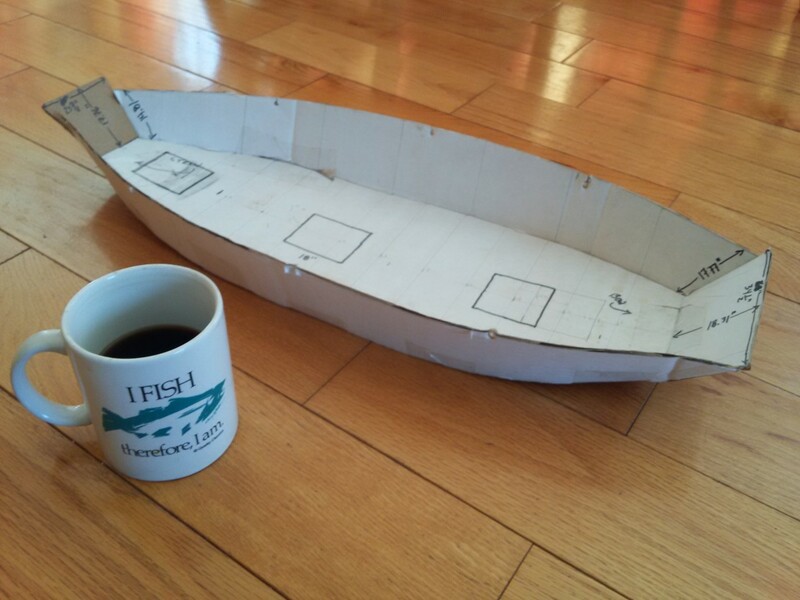 After ordering the marine plywood, I built a scale model of the skiff. 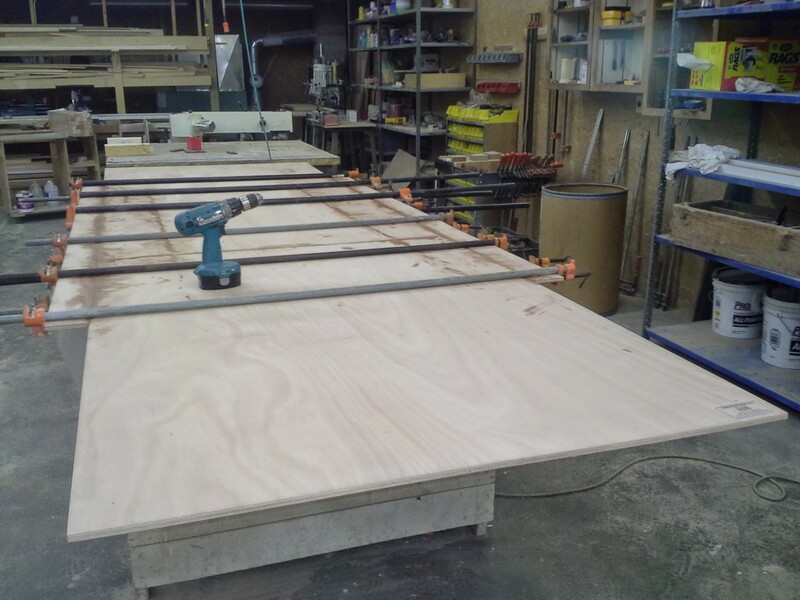 To create 15 foot long panels for the sides and bottom, 4'x8' sheet of marine plywood are joined with scarf joints. 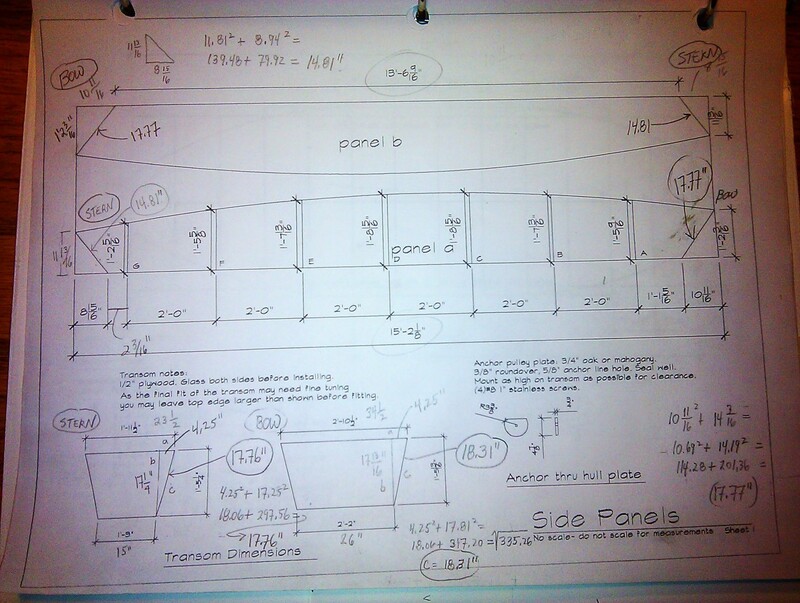 This is the bottom panel. 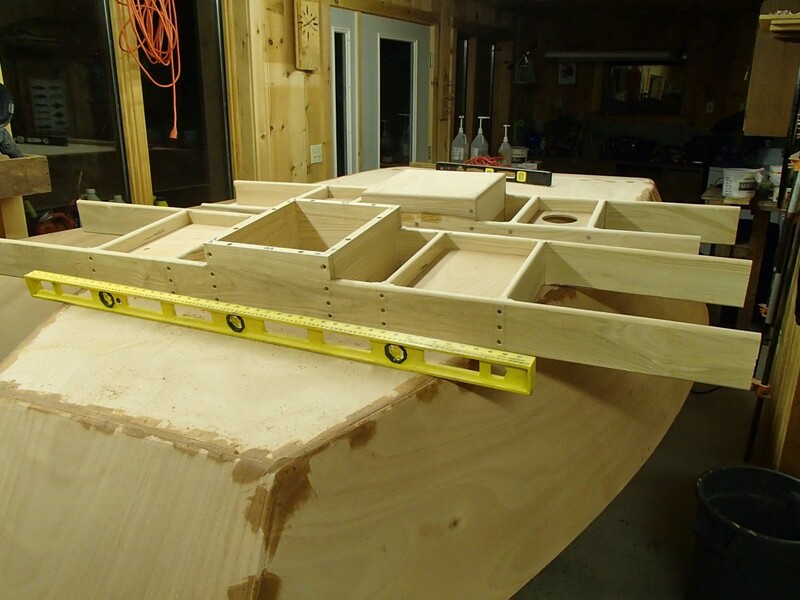 It consists of two 4' x 8' sheets of plywood with two 8' long 6" pieces of 1/2" plywood scabbed on to each side. 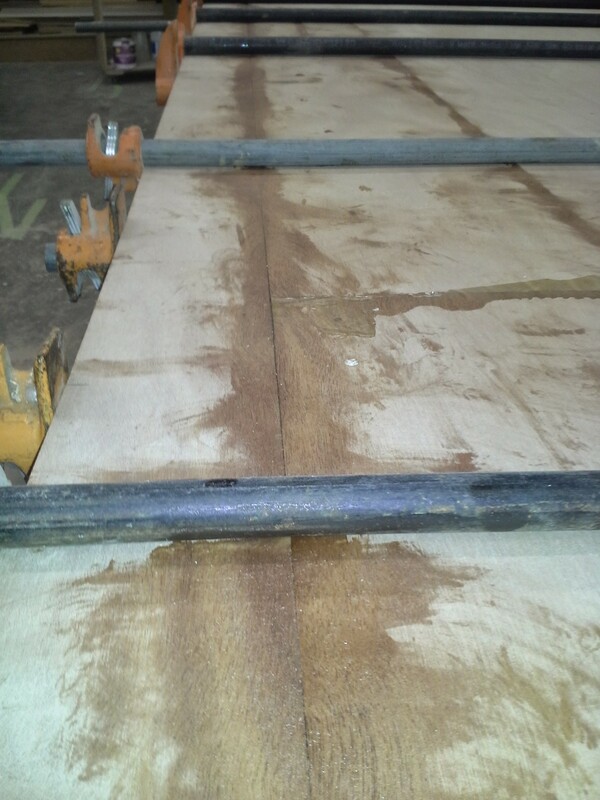 The bottom, two side panels and both transoms are stitched together with bailing wire. 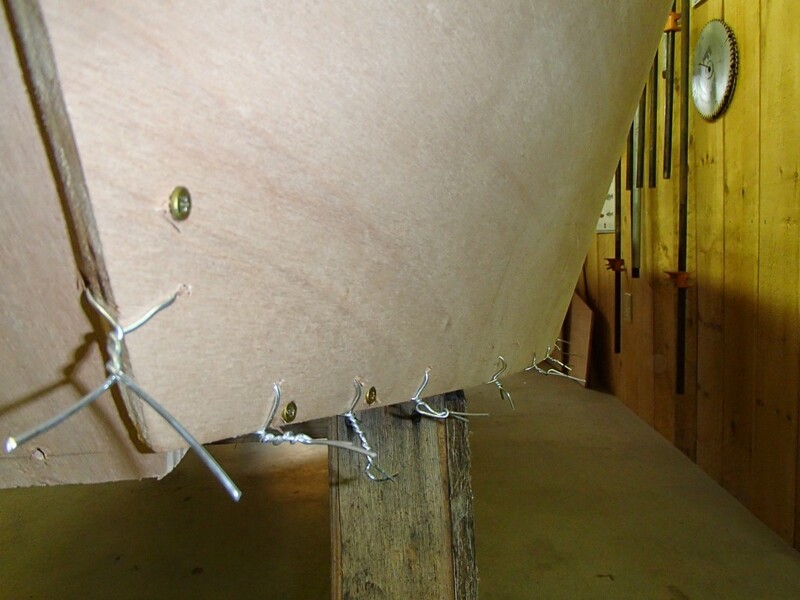 This photos shows the boat after it's been stitched together. 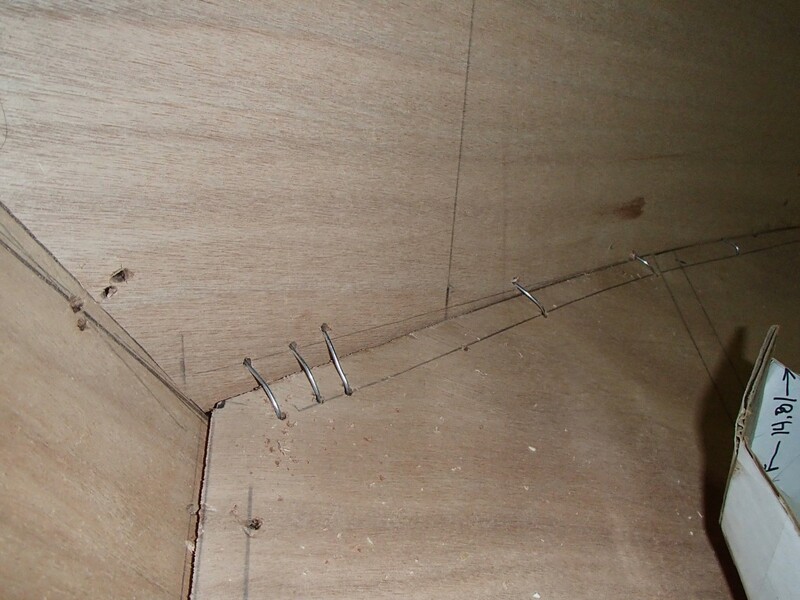 Close up showing the bailing wire near the stern transom. 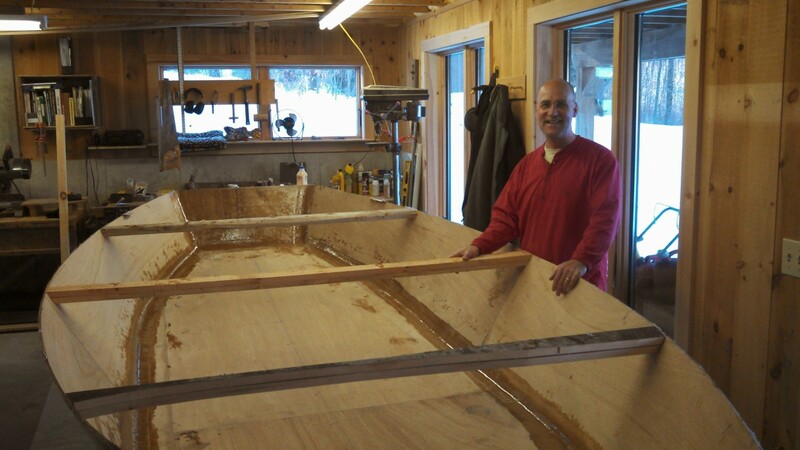 A happy boatbuilder after I have completed the fillets along the joint where the side panels meets the bottom panel. 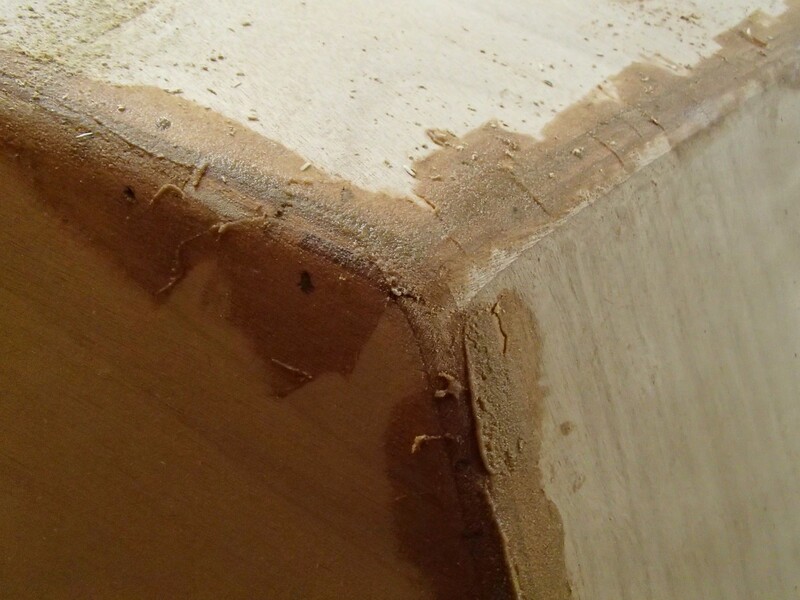 After mixing the two part epoxy, wood flour is added to until the epoxy reaches a peanut butter consistency. 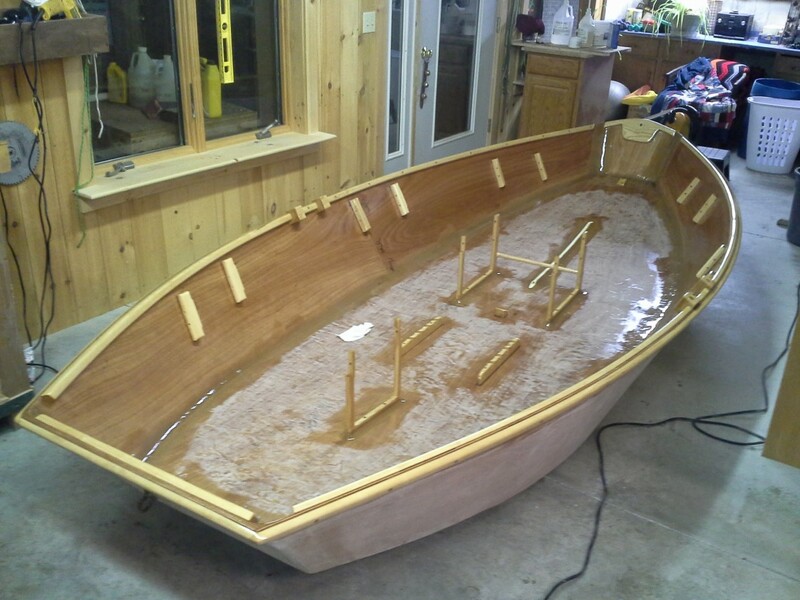 Outside of hull after applying a coat of the "peanut butter" epoxy. 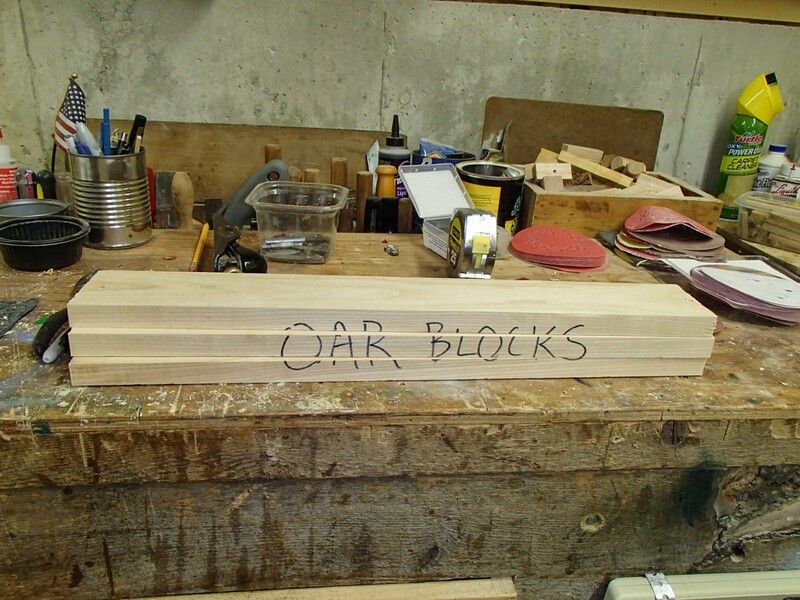 Stock used to construct the oar blocks. 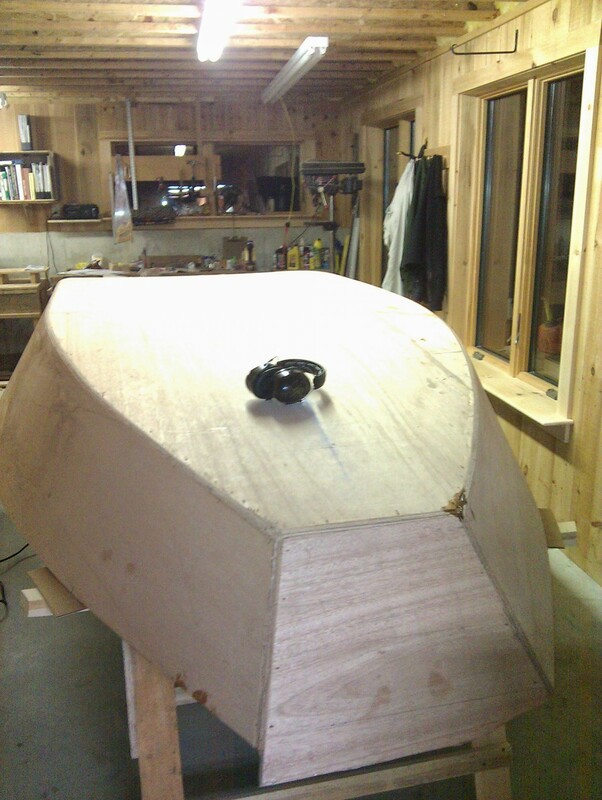 The outside of the hull is ready for the glass and epoxy. 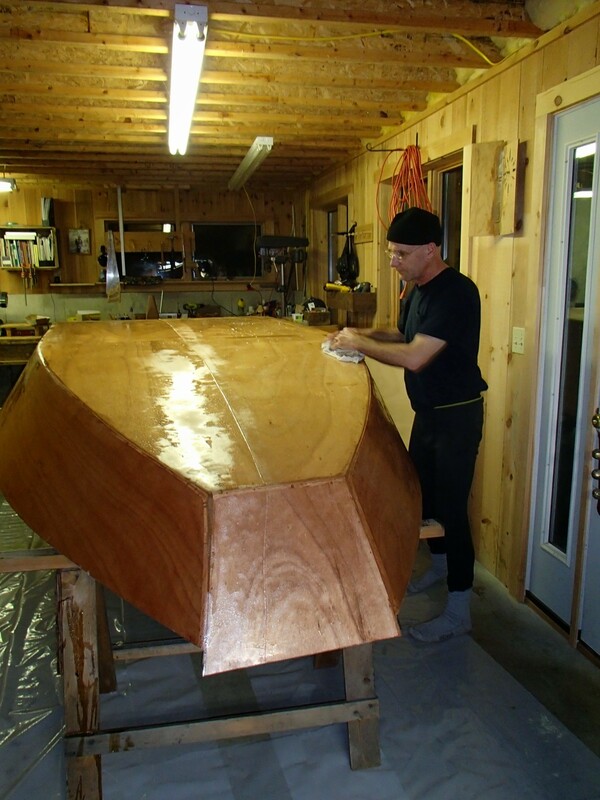 The glass is draped over the boat and with a little coaxing it readily takes the shape of the hull. The glass is on and now it's time to saturate the glass with epoxy. 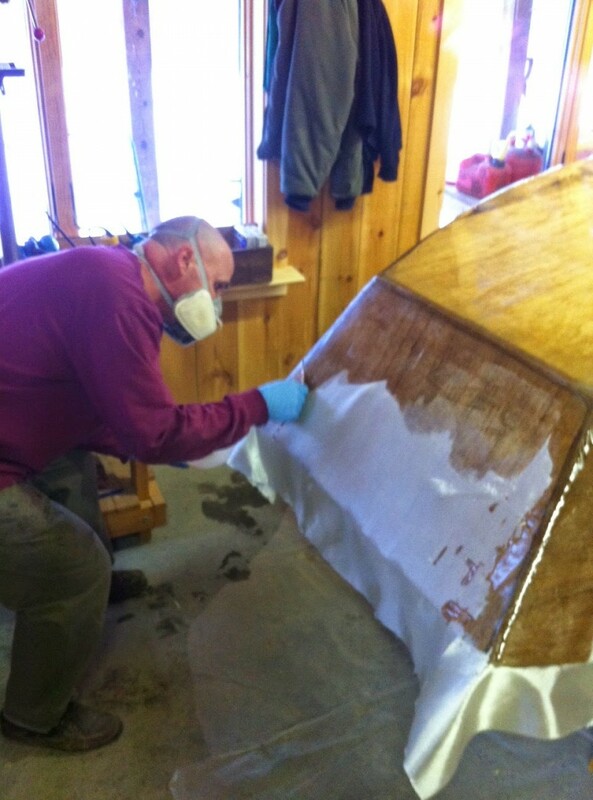 Slowly but surely the entire boat is encased in epoxy saturated fiberglass cloth. I asked a friend to join me as this works goes much faster with a second set of hands. 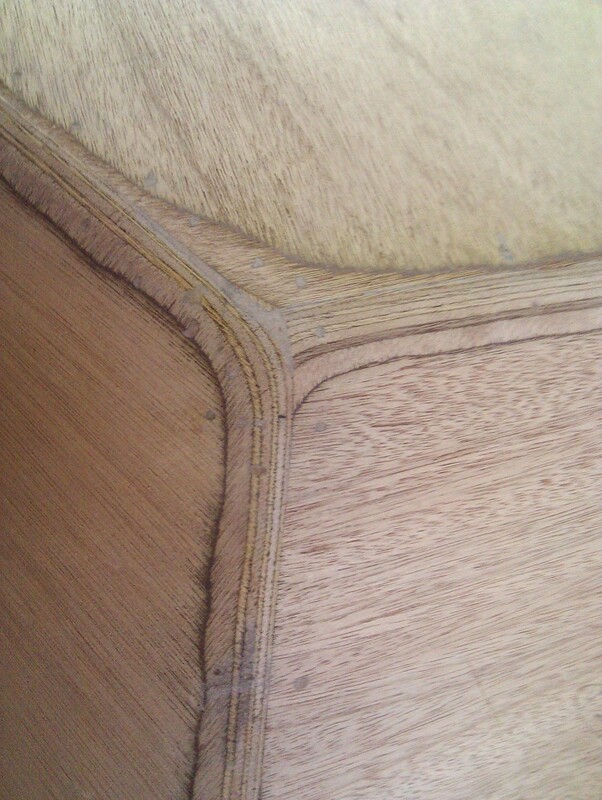 The next day, after more sanding, it's ready for another coat of epoxy. 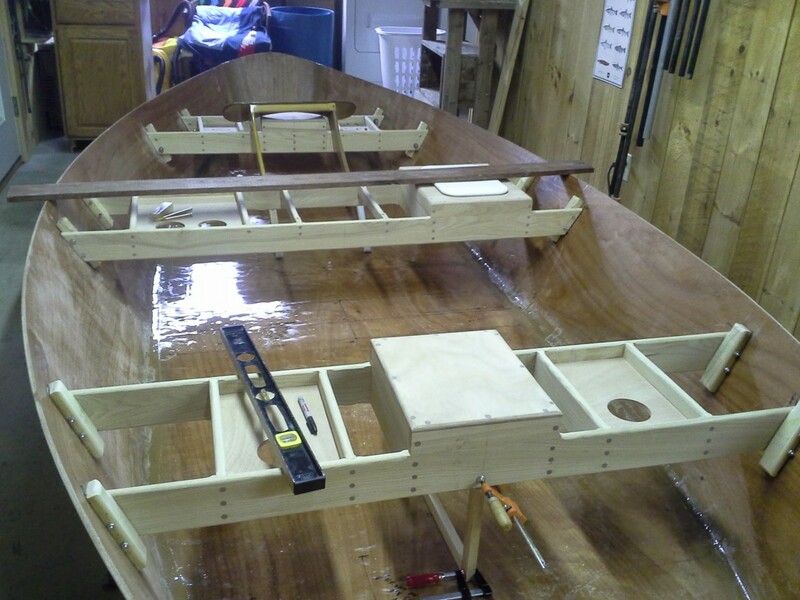 At this point, the boat is righted to prep the inside for epoxy and glass. 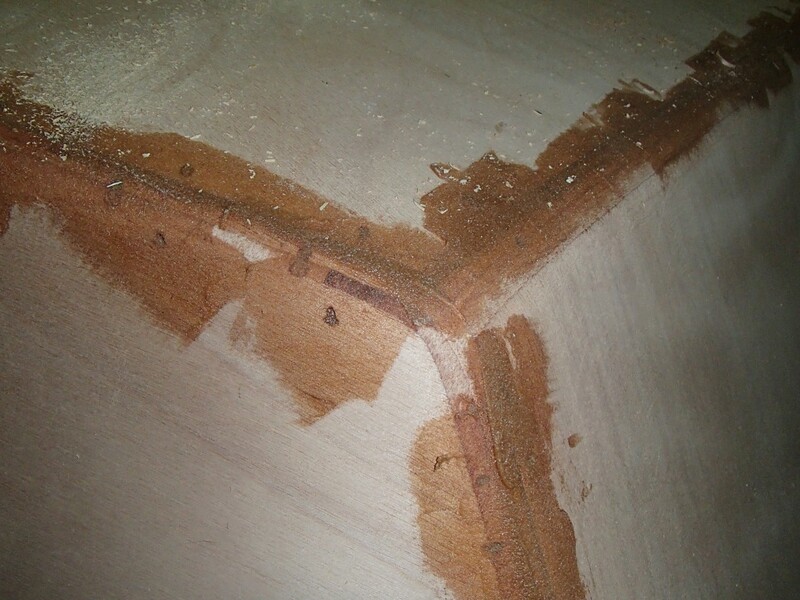 The fillets along the chine are covered with fiberglass tape and epoxy. 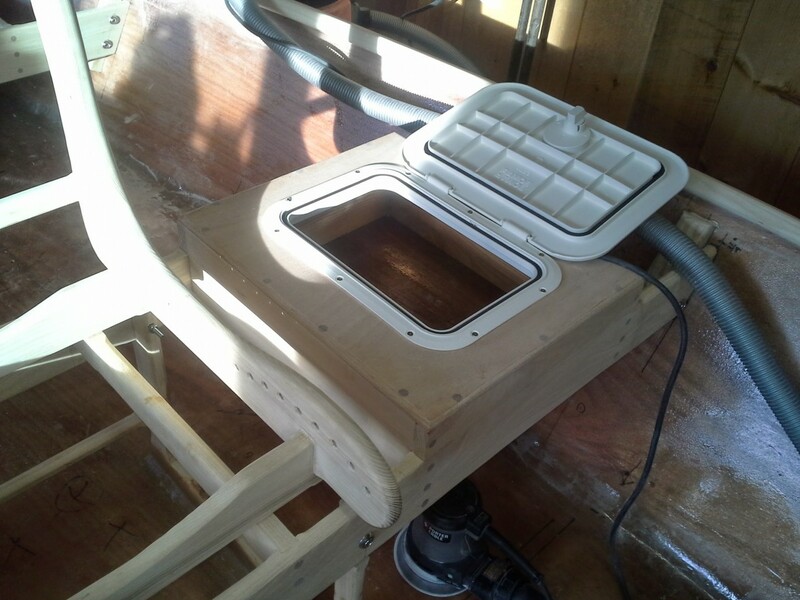 I decided to complete the interior of the second boat with thwart style seats rather the pedestal style used in my first boat. 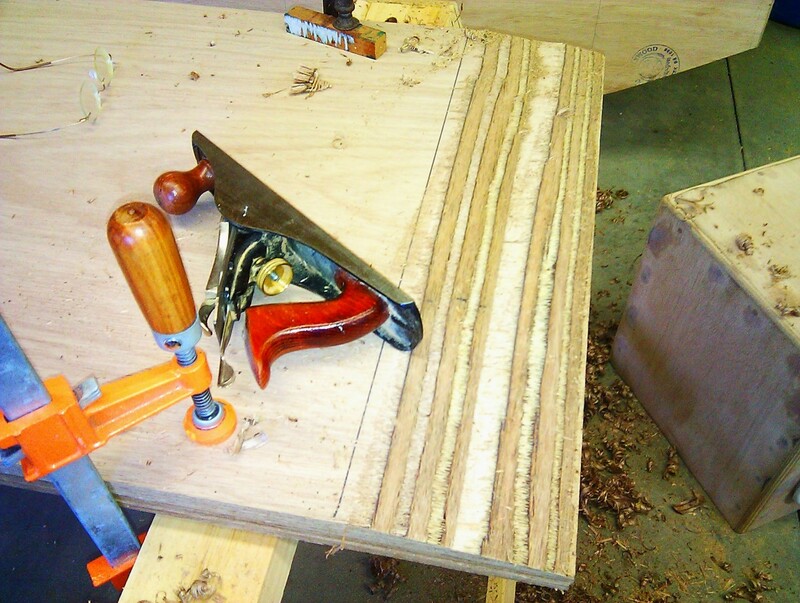 The nearly completed guide seat. 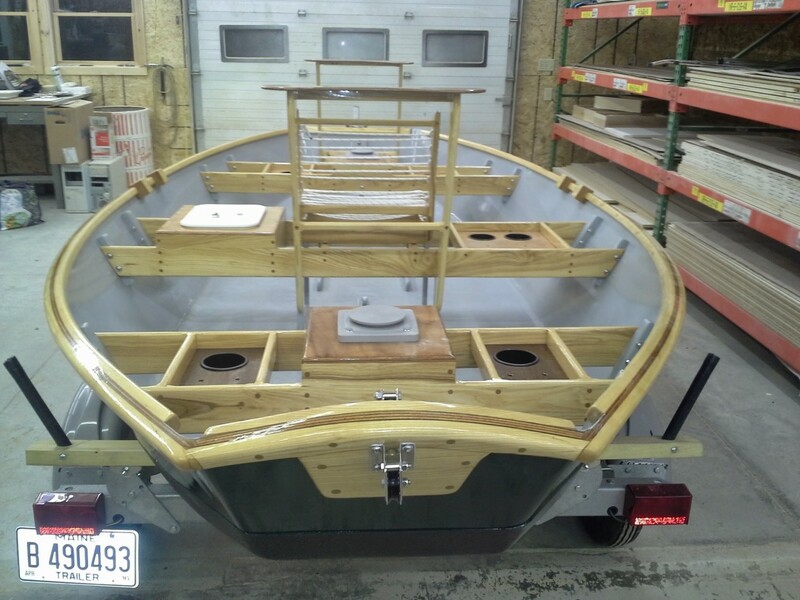 It's ready to be strung with rope. 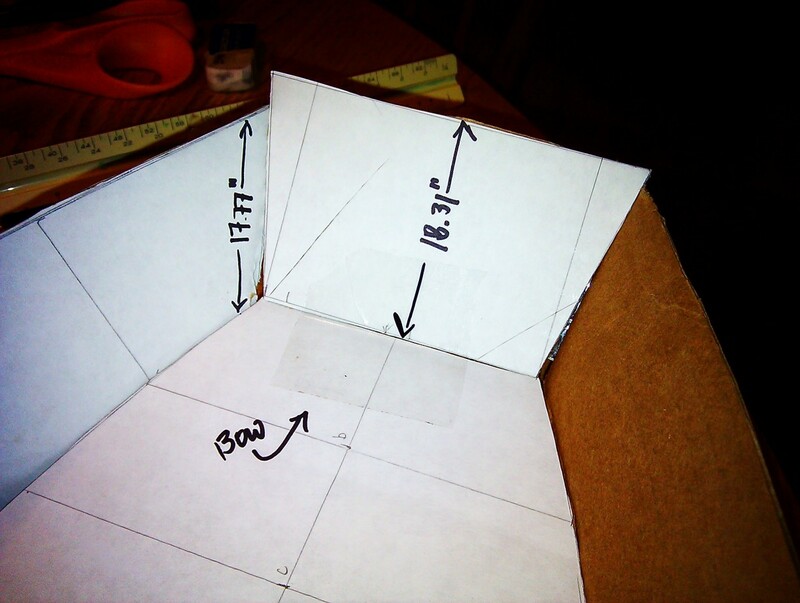 These seats took far more time than expected to construct. 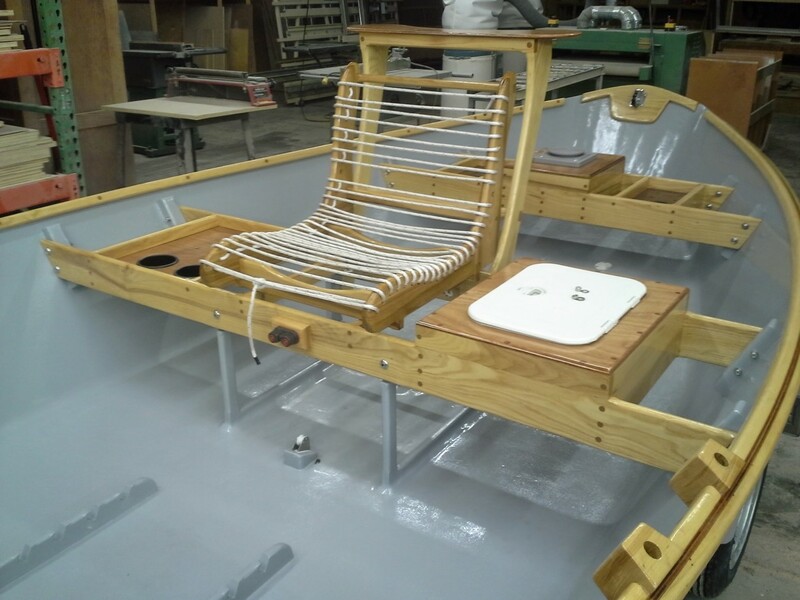 The glass has been applied to the inside of the hull, the seat braces are in place, foot brace secured and i have attached the cleats for the seats. 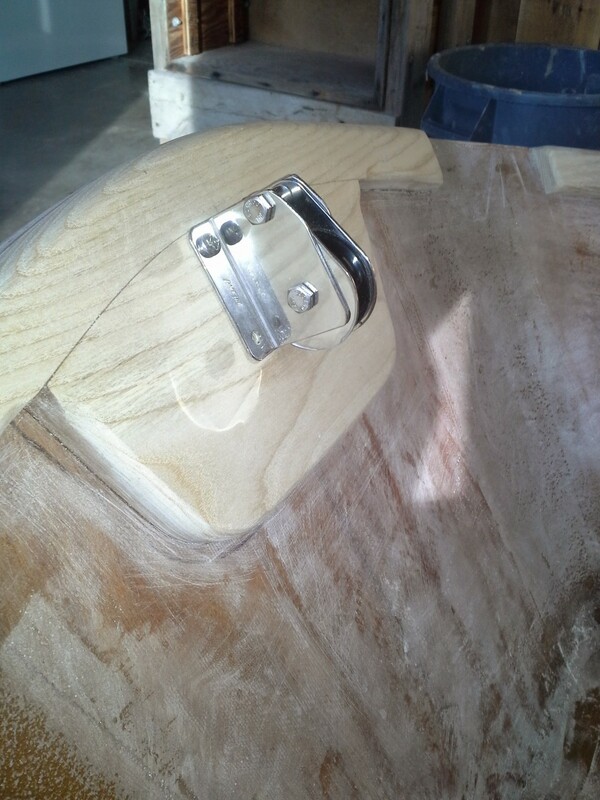 Close up of seat attached to the hull. 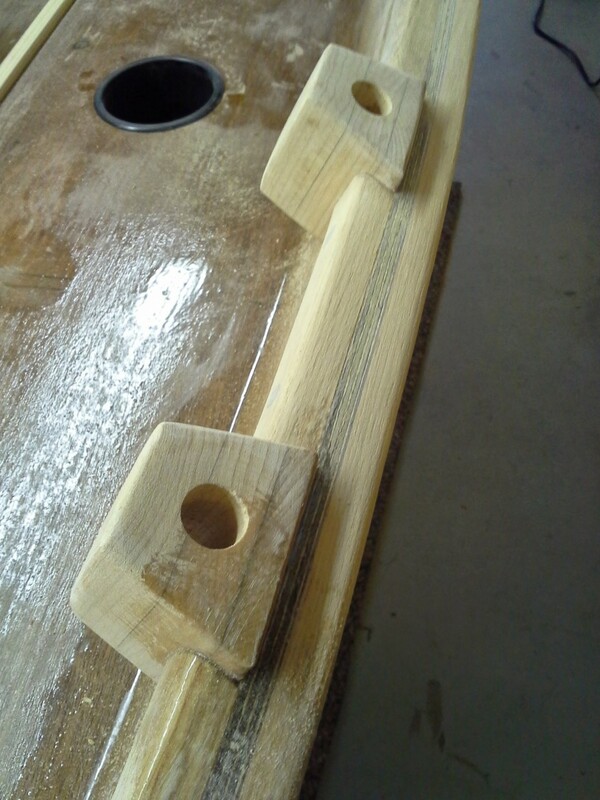 Oarlock blocks installed with brass oarlock bushing. 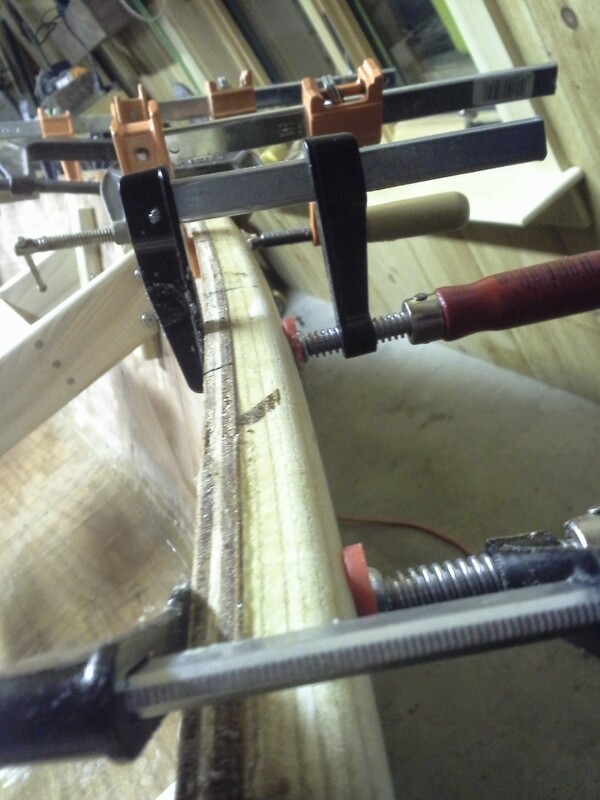 Attaching the ash gunnels. 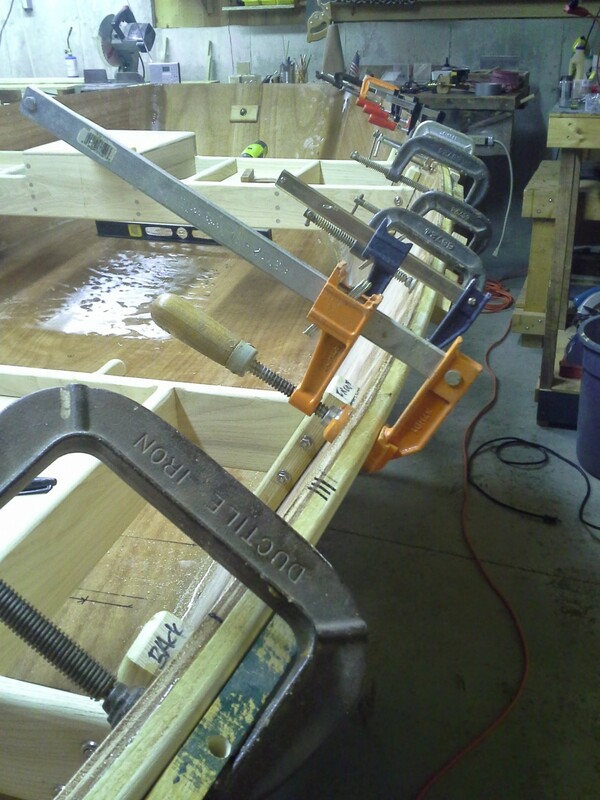 You never can have too many clamps for this job. All the seats are in, at least for the moment. At this point I am fitting the front casting brace. 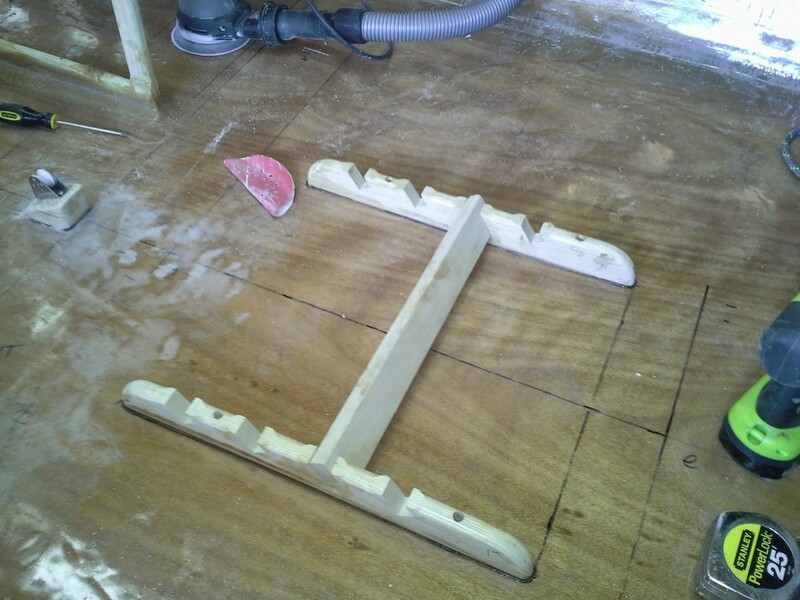 The front casting brace attached to the bow transom. 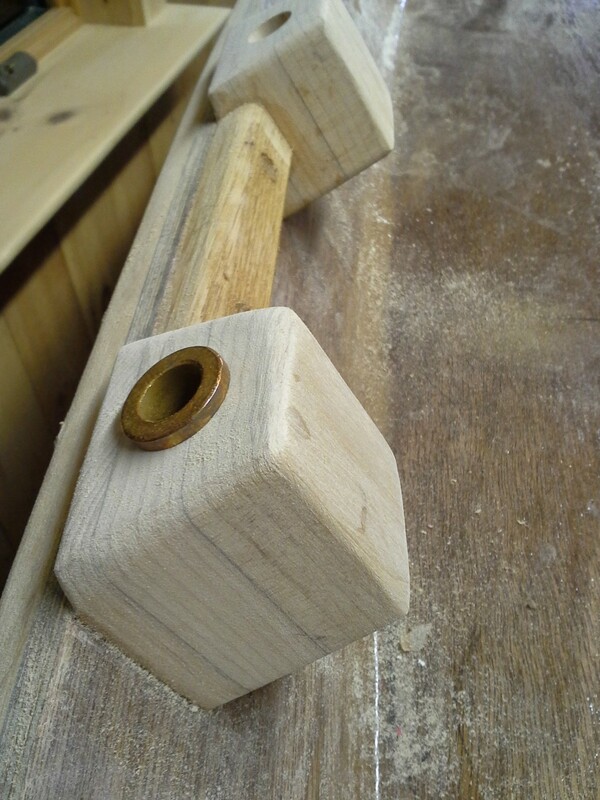 Anchor pulleys are in place. 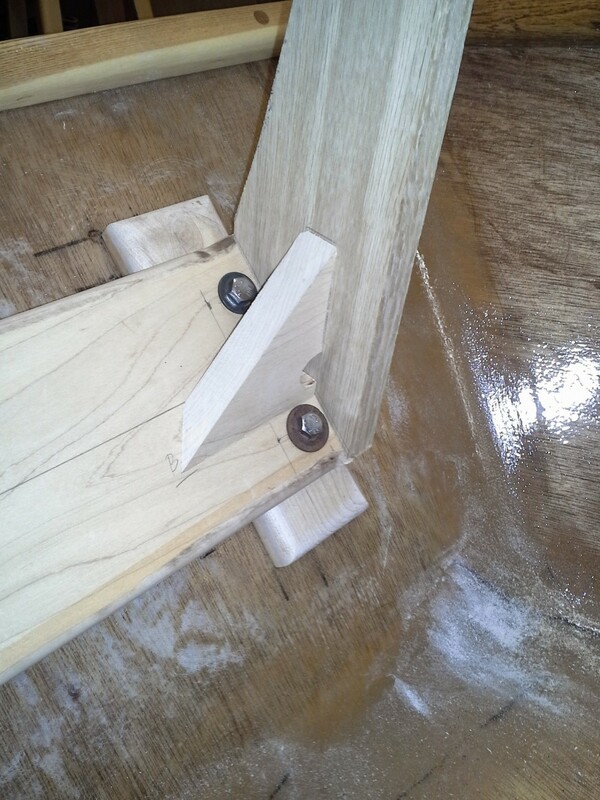 The guide seat is attached to the center thwart. Waterproof box provides convenient storage.The guide seat is attached to the center thwart. Waterproof box provides convenient storage. 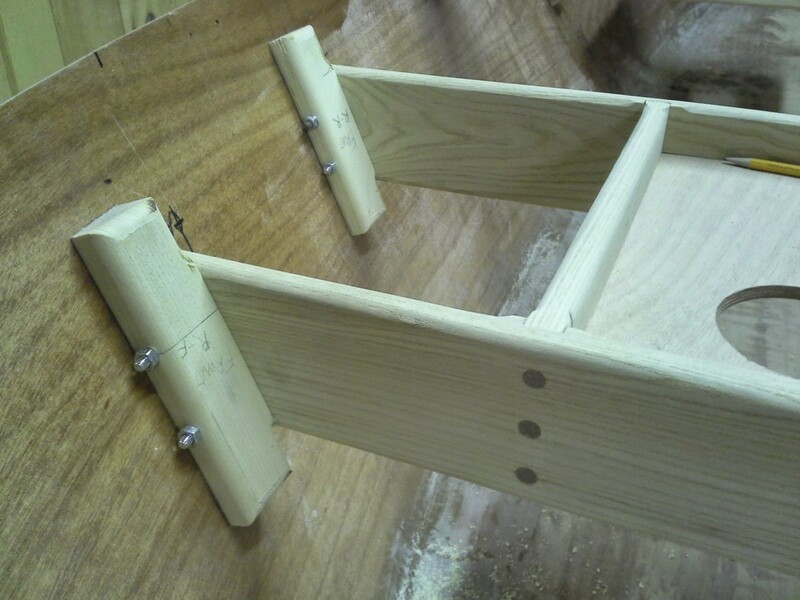 The adjustable foot brace in place. This is an item I failed to include in my first boat. 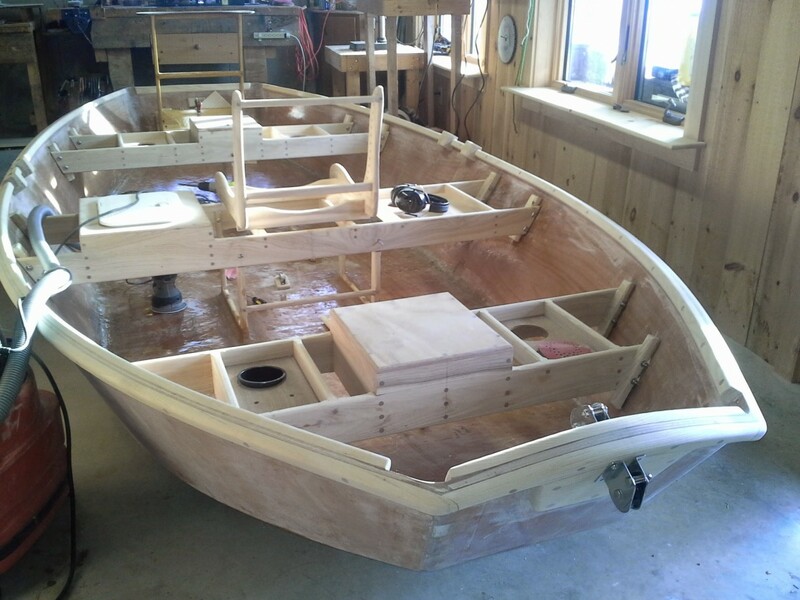 Now, it's beginning to look like a boat! Believe it or not the boat will exit the basement through the door in the picture. 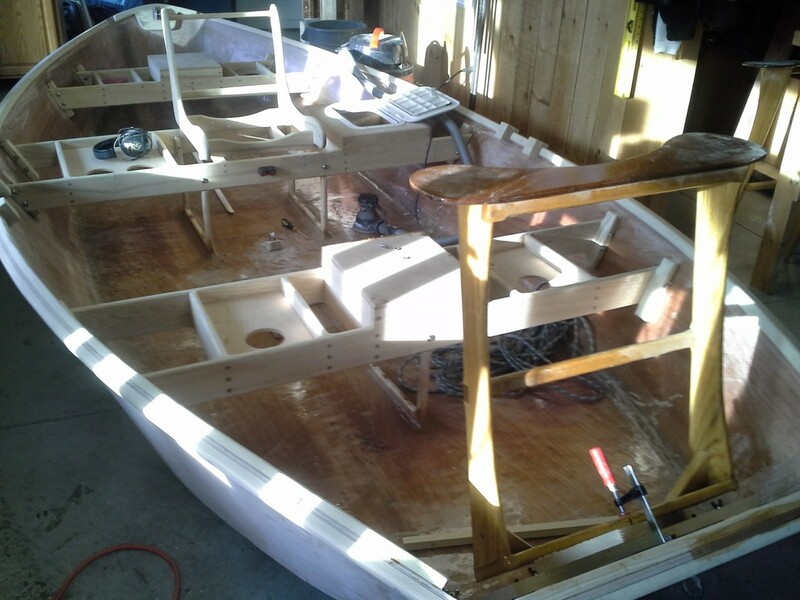 It's about ready for paint. That means it is time to remove the seats, remove it from the basement and get it to my good friend's cabinet making shop. 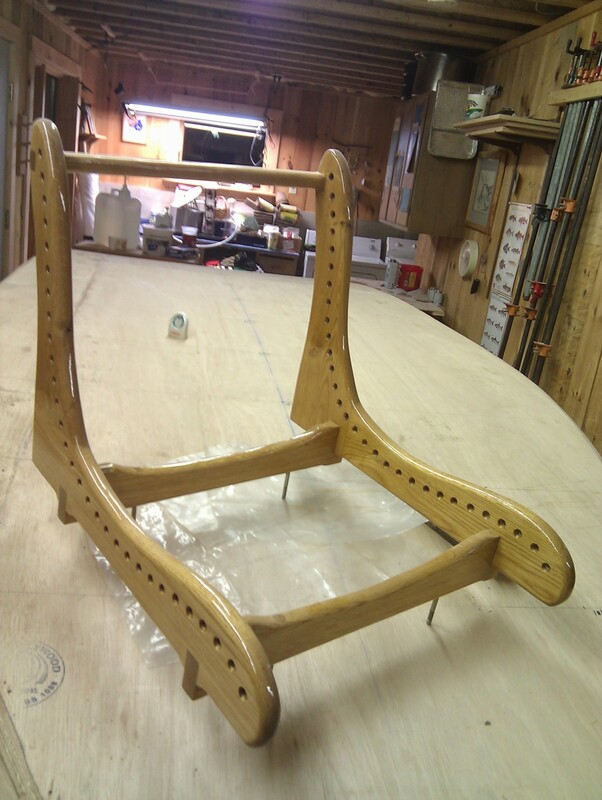 A coat of primer on the inside and out followed by two coats of finish paint. I used a non-slip paint on the inside. 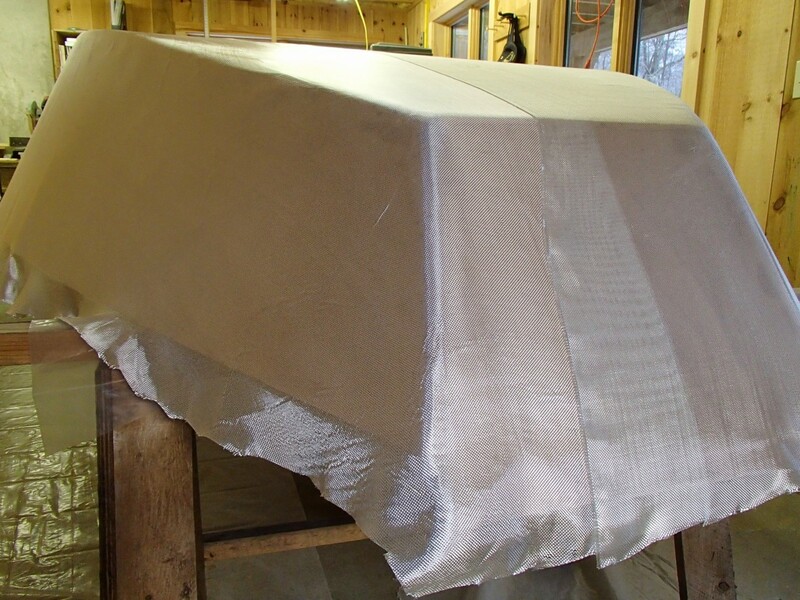 The bottom of the boat and four inches up the chine was sprayed with Linex. 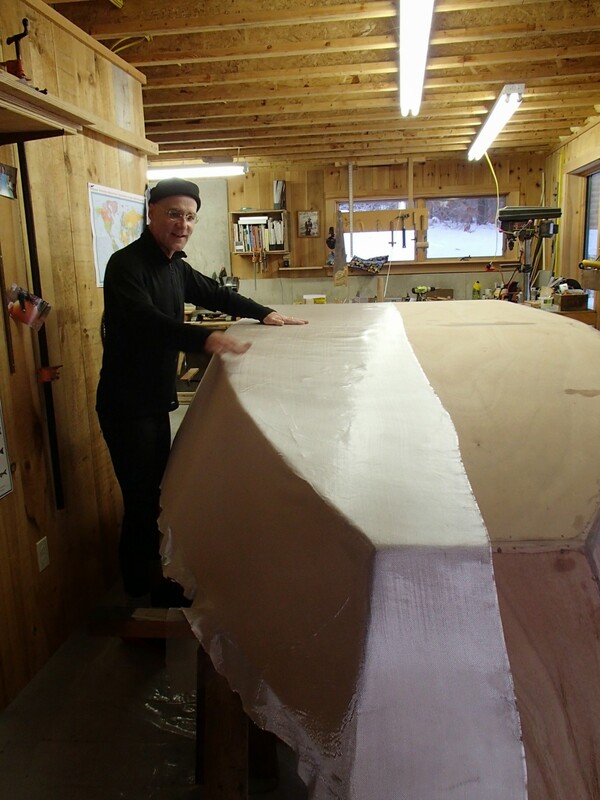 The Linex added weight to the finished boat but for a very tough and relatively slippery bottom. 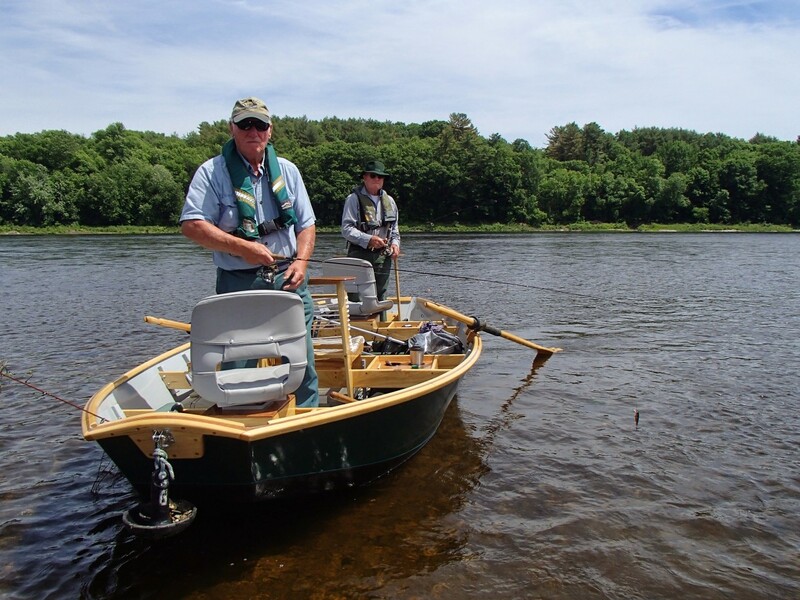 The maiden voyage on the Kennebec. 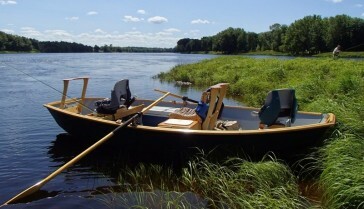 Taking a break on the Penobscot.